There are a lot of rumors, assumptions, and misinformation surrounding online marketing. But when it comes down to it, what matters are the cold hard facts–are people visiting your site and are you getting the conversion rates you are looking for. Much of the data that is obtained for online marketing flies in the face of popular beliefs. This means that many websites are making a number of serious marketing mistakes. But don’t worry, these mistakes are avoidable. 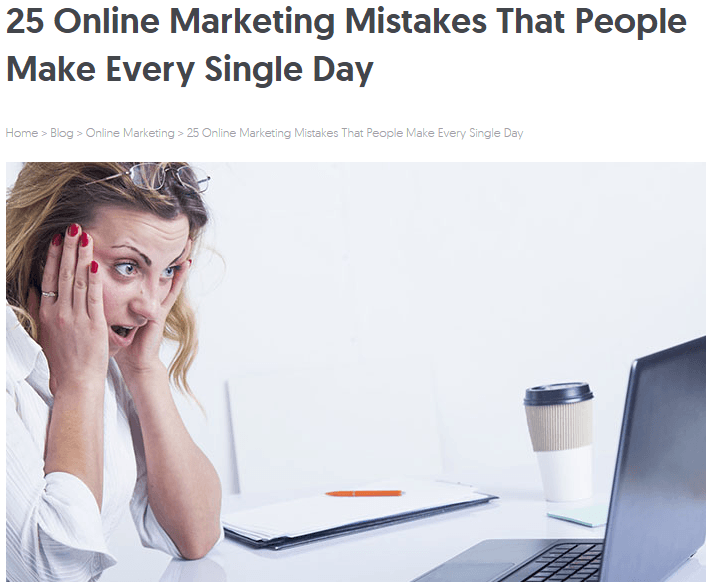 Keep reading to find out if you have been making any of the top five marketing mistakes and how to correct them if you are. The single biggest myth of content marketing is that people browse like marketers–they don’t. They use the internet like users. Like normal people who don’t do marketing for a living. Users find specific sites and are either pulled in by the content, or they discard the site and turn to a more helpful one. If the site really connects with them they might follow it through a social channel. It is essential to connect with the user and build trust on that initial visit so that at some point down the road when the user needs something they remember your site and return to it. Reinforce Something Already Believed–People want to be told they are right. Giving them. Produce content that provides additional support and evidence for something your community already holds to be true and they will gladly share that information throughout the community. Refute an Opposing Argument–Once again, people want to believe they are right, so refuting an argument which goes against the communities beliefs will draw their interest. Be in Someone’s Financial or Promotional Interest–If it is good for them, then sharing your content will be the obvious choice. Leverage Group Inclusion Dynamics–Using content, such as online quizzes, that draws in users and then prompts them to bring in their friends and families is a great way to spread your content. You can play on people’s desire to feel like they are part of something and connected to other people and they will share your content to spread that connection. Make the Sharer Look Smart, Important, Worldly, etc.–People are eager to share content that will make them look good. Write content that will make a specific community feel like sharing your content will put them in a favorable light–and watch your content spread. Always ask yourself–who will support and amplify this content, and why? If you produce content but don’t also find means of amplifying your content and making it reach more viewers, then it is going to have a very hard time going anywhere. Broadcast: Social media, emails, and event promotions. One to one outreach: Social, email, and in-person communication. Paid Promotion: Social media ads, google marketing ads, etc. Figure out which means of amplification will best reach your target community and get your content out there. Don’t commit the marketing mistake of making great content but failing to make it accessible to your potential users. Despite what you may have heard, SEO is not dead. SEO plays an extremely important role in getting your content viewed. When people are ready to take action and are looking for specific answers, SEO brings your content to the forefront to offer solutions. Going viral is rarely the easy overnight success that it appears to be. Success takes time, dedication, patience, and lots of effort. Slow, steady work will eventually bring about results.